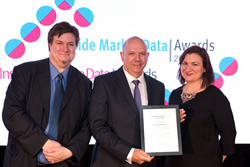 Ben Mendoza, Chairman of MDSL, a global leader in Technology Expense Management ("TEM") and Market Data Management (“MDM”) solutions, has been inducted into the Inside Market Data Hall of Fame. Following the North American Financial Information Summit conference in New York on May 23, Mendoza was recognized during the IMD/IRD Awards Evening for his influence in the market data industry and being the first to develop a digital platform for managing market data inventory and data costs. Mendoza continues efforts to streamline data management, bringing efficiencies to the industry while inspiring a community of rival platforms, encouraging competition and innovation. Mendoza founded MDSL in 1995 with a vision to create an expense management solution for the complex market data subscription services for financial enterprises, eventually expanding into similar technology spend categories including telecom, mobility, cloud, and IoT technologies. To this day, MDSL are world leaders in Technology Expense Management Solutions, Market Data Management and related services and partner with enterprises to provide clarity, control, compliance, and cost savings across their global technology estates. The Inside Market Data Hall of Fame recognizes individuals who- through their ability to create new products, inspire actions in others, or take it upon themselves to effect change – have contributed to shaping the market data industry, and whose legacies continue to produce innovation and inspire others to follow in their footsteps. Previous inductees include the former mayor of New York City, Michael Bloomberg and Telerate founder Neil Hirsch.